Ever Heard of the Saying “10% of the Anglers catch 90% of the fish”? Let Fishermen’s Spot teach you to become one of the 10%! Have you been thinking about learning to fly fish but thought it was too difficult? We have the class for you! Learning to fly fish with Fishermen’s Spot is fun and easy and we will teach you everything you need to know to embark on a lifetime of angling enjoyment! These classes are our most popular throughout the year. David Shaffer’s expertise has helped many newbies get their first fish on a fly! Join us and learn the basics from tying Master Glenn Hiroyasu. This one day class is designed to give you skills to tie multiple pattern styles and is a great way to get into this facet of the sport! 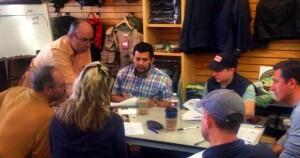 This class is designed to teach, in a logical way, the basics of tying a fly. Each step in the process is a prelude to a somewhat more involved process. Each pattern is a prelude to a more involved pattern. In this class, tools and materials, proportions, methods of application and techniques for fishing the flies will be discussed. After completion of the class, the student will have learned the basic techniques for tying both moving and still water flies as well as having a basic selection of patterns. Fishermen’s Spot offers one hour private casting lessons by appointment 7 days per week year around, weather permitting. Lessons are designed to address your individual skill levels and assist you in developing technique that will make your time on the water more productive. You may use your own equipment or we can provide top quality gear at no extra cost. Specialized casting instruction for intermediate or advanced is also available. Learn to Fly Fish the Surf with our resident expert Dean Endress! Each class consists of a 2hr Wednesday class in the shop followed by a 4 hr Sunday “on the beach” fishing session.